FIFA World Cup 2014 is on fire and about to blast on 12 june in brasil. 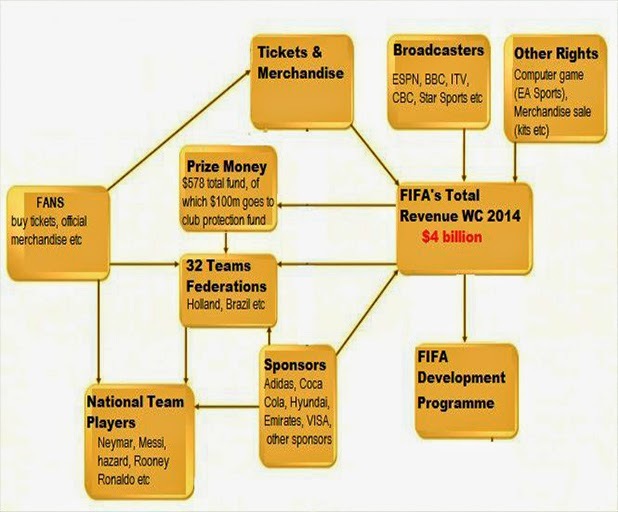 But can anyone imagine how big is this business for FIFA(International Association of Federation Football). FIFA research, which took a year to produce after the FIFA World Cup 2010 in South Africa said More than 3.2 billion people watched live coverage of the 2010 tournament for a minimum of one minute and 909 million television viewers tuned in to at least one minute of the 2010 final at home. Some 619.7 million people also watched at least 20 consecutive minutes of Spain’s 1-0 extra-time win over the Netherlands in Johannesburg. The average official rating was 188.4 million for each match. For the first time ever in the FIFA history most of the United States viewers were attracted by the 2010 Men’s World Cup. According to ESPN broadcasts averaged a 2.1 rating (2.29 million households and 3.26 million viewers), a 31% increase over 2006. The final between the Netherlands and Spain was the most-watched men’s World Cup game with 15.6 million viewers. The value of the FIFA World Cup as a sport is getting richer even in United States. Previous month Fox Sports won the US English-language rights for 2018 (Russia) and 2022 (Qatar), beating out bids from ESPN and NBC. ESPN bought the rights for the 2010 and 2014 rights for $100 million. While official figures for the new television deal have not been officially released, John Ourand of Sports Business Journal was told Fox may have paid between $400 million to $500 million. That is quite plausible since Univision bought the U.S. Spanish rights for $425 million for the last two World Cups. FIFA World Cup is the biggest competition on planet earth and will be making $4 billion in Revenue in this World Cup 2014 but this revenue will also be distributed. Here is small Chart of how it will be done. Still, the business of the World Cup is not cheap to operate. For Brazil, FIFA will make total payments of $576 million to the participating member associations, the clubs of participating players and for the club protection program, 37% more than the World Cup in South Africa for years ago. The biggest lion’s share of the payments will go towards a record $70 million of prize money, 75% more than the 2010 competition. The 2014 World Cup winners will receive $35 million, while the 16 teams that are eliminated in the group stage will each collect $8 million. Taking into account the total number of teams, players and the duration of the World Cup, the per-player, per-day amount will be $2,800 in Brazil. Overall the financial success of the FIFA World Cup is great for the sport’s growth. FIFA’s budget for the years 2015-18 is $4.9 billion, of which $2.15 billion is slotted for the 2018 World Cup in Russia. In aggregate, 78% ($3.8 billion) of the $4.9 billion will be directly invested in soccer.